Justin Nichols and Bill Corten putting the 595 through a few tight turns offshore. 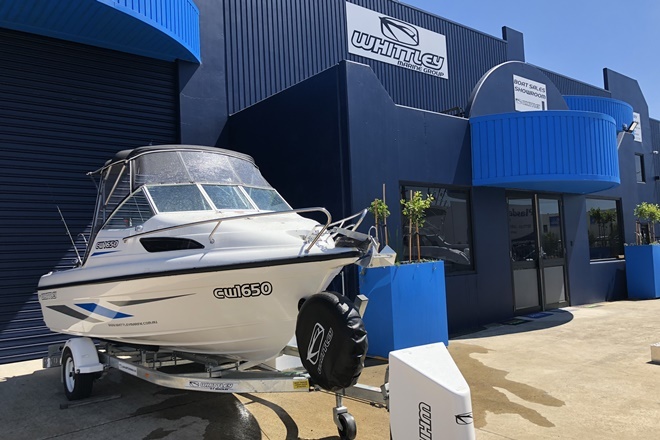 AFTER checking out the all-new 595 and the 530 Cruise Crafts immaculately displayed under lights at the Brisbane Boat Show, plans were made to put the boats through their paces on an offshore fishing trip. 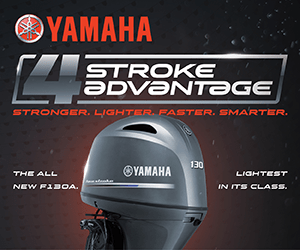 I can’t think of a better way to test a boat than to actually take if for a run and fish out of it for a day. For logistic reasons we took both boats offshore, so each could be tested and alternately used as the camera boat. And of course there was a bit of fishing thrown in for good measure. In this review I will be focusing on just the larger of the two models, the 595. I will cover the 530 in a later article. The Cruise Craft 595 Outsider, which has been badged the OS, is a totally new model from the ground, well actually, the hull up. 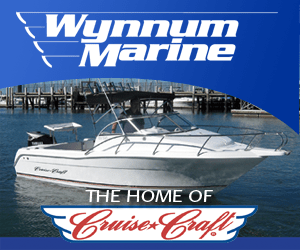 It hasn’t been cut, stretched or anything else and as Kevin Nichols from Cruise Craft commented, “It’s brand new from the lead in the pencil to the finished product.” The new hull has increased in size from the keel to the gunwale, which has given it higher sides and allowed for a gentle flair. Although this section of the hull has increased, the distance from the keel to the top of the windscreen has remained in proportion to other models. Thus there is a larger hull with more super structure for increased strength without any additional overall height. Another feature that has been incorporated into the new design is a one-piece moulded floor liner. 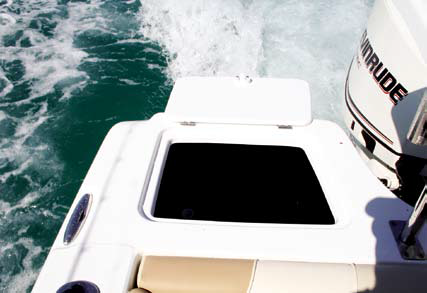 This fully moulded fibreglass liner is removable if work needs to be carried out after the boat has been built. The internal side panels have also been given a facelift and are now in two pieces. Once again, allowing for easier access if required. In creating this new floor lining the team at Cruise Craft has created a fully sealed platform. Part of the reason for this is to clean up the production process, as well as allowing areas where foam couldn’t be sprayed to become airtight voids when the layers are sealed, adding to the safety of the vessel. The drain plug has also been removed from the well in the cabin as part of having the sealed floor lining. In addition, the kill tank has been moved to the aft of the fuel tank and all new models will now be fitted with a 12V flood drain valve which can be operated by the flick of a switch. This will allow control of water flow without having to get on your knees to undo or put in the bung. 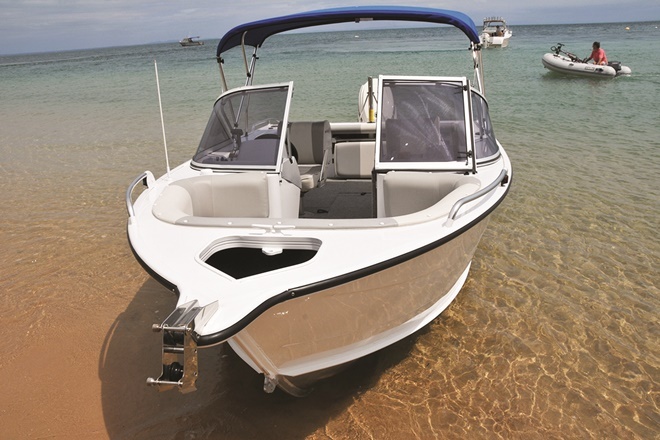 So in essence the new model 595 has three membranes incorporating the hull, floor liner and deck, which have been joined to make one solid and functional platform. 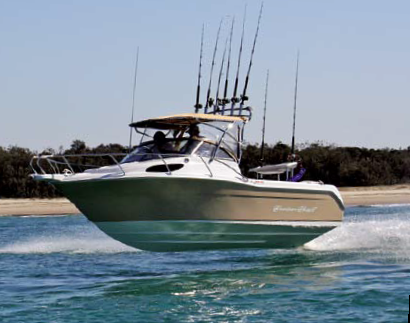 Adjusting the hull enabled a finer entry which has improved the smoothness of the ride into the waves. Although the test day was a cracker in terms of weather, we still managed to find a few waves. And as you can see from the photos, Bill Corten is pointing Justin Nichols in the right direction to find a few for photos. Other alterations to the design include changes from the old scuppers to quick release deck stainless drains. Previously the windscreen was four-piece, but the new model has incorporated a two-piece design with only a join in the middle. The additional struts give it support and also provide a cleaner line. In keeping with the cleaner lines, a totally new stainless targa and rocket launcher has been designed. It has been modified to allow easier access around the side, giving you good vantage points to grab on to. Although the targa is now connected to the boat at only two points on each side it actually has more strength and moves much less when fully loaded with rods and while cutting through chop. However, this could also be due to the new hull, but is probably a combination of both. Other nifty improvements include the newly designed seats. These are extremely comfortable and I really like the design. As these boats were hot off the factory floor, the grab handles hadn’t been fitted at the time of testing, but they will give the crew something extra to hold on to. I also liked the new colour, especially when I saw it outside in the light. With the early morning sun reflecting off the side of the hull it looked a treat as we made our way down the Rainbow Channel. But more importantly, how did the new hull ride – did it do what it was meant to? Well the short answer is yes it did! The finer entry definitely made cutting through what chop we could find even better. 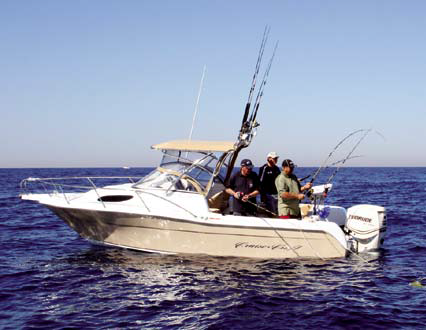 Plus the stability was still there, enabling three or four guys to fish easily in offshore conditions. 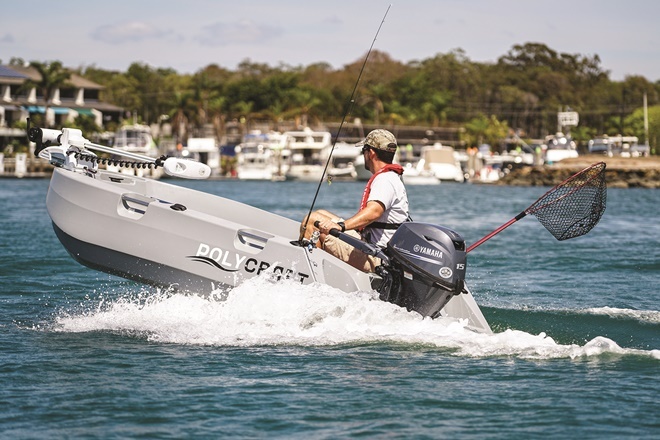 The test boat was fitted with a 150hp E-TEC, and although rated to a maximum of 175hp, the 150hp had plenty of poke out of the hole and good top end. There is plenty of room for four guys to fish. Having a black live well is a clever idea. New seats make the helm very comfortable. Slicing through the water on the way to offshore fishing grounds. 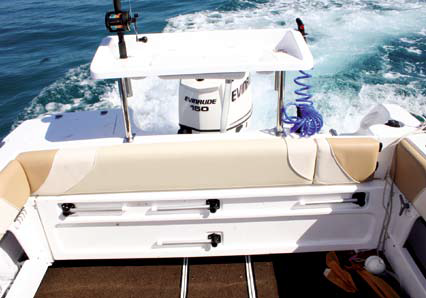 Combining the decent fuel economy of the E-TEC at cruising and 190 litre underfloor tank, you have the capacity to travel wide offshore. And that is what this boat was made to do. Although a totally new design, concepts from the 685 and 625 have been used towards the stern of the hull, ensuring it remains stable at rest and providing a good fishing platform. I have been lucky in that I’ve spent many hours, even weeks fishing out of various Cruise Craft models, so was intrigued by the new model. 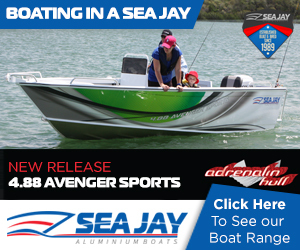 With a hull length of 5.95m and a 2.44m beam, the final result is a welcome addition to the range in that it provides a capable offshore fishing vessel that is easy to tow, launch and retrieve. 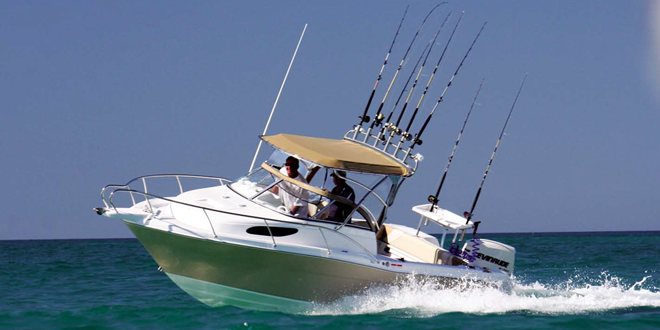 This model is sure to generate some interest from people looking for their first offshore boat or those upgrading existing boats. A massive list of standard inclusions consists of a full length folding rear lounge, upholstered seats and bunks and cockpit carpet, just to name a few. With a base price from around $79,000 you get plenty of standard fittings. 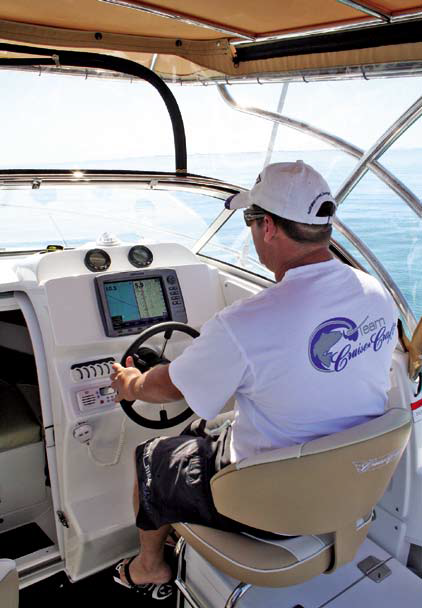 Actually all you need to add is your choice of sounder and GPS and you have everything needed to hit the water. 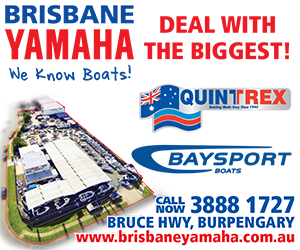 For more information and a full list of inclusions on this or any of the other Cruise Craft model, give the guys at the factory a call on 07 3396 9777 or drop in and see them at 31 Fox St, Wynnum.